The UK’s historical relationship with many African countries still counts for something, but, as Prime Minister Theresa May will find on her trip to the continent, the UK vies for attention with larger economies offering greater riches. Mrs May is travelling to South Africa, Nigeria and Kenya this week on her first African visit as prime minister as she looks to boost Britain’s post-Brexit trade. 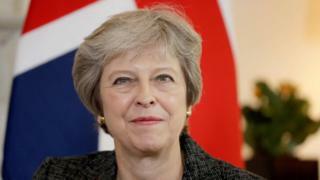 Britain’s aim after leaving the European Union in March next year is to “deepen and strengthen its global partnerships”, Mrs May said in a statement. But it might be a hard sell. The UK is introducing legislation that should mean that African businesses will access the UK market on the same terms as they do now. Nevertheless, African countries, many of them former British colonies, will need to redefine their relationship with Britain in the wake of Brexit. The continent’s leaders need to decide who to prioritise: an ambitious but friendly China, the huge European Union bloc, the potential riches of the United States, or the historically-linked United Kingdom. In 2015, total trade (imports and exports combined) between Africa and the UK amounted to $36bn (£28bn), but that figure for the EU as a whole was $305bn. 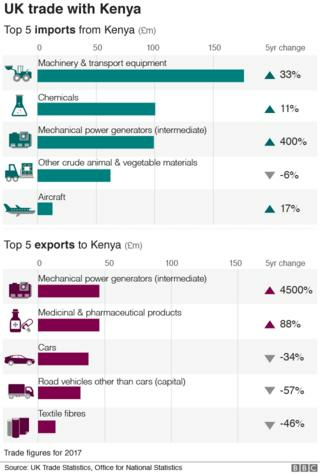 In the same year, trade between China and Africa totalled $188bn, and between the US and Africa is amounted to $53bn. To sweeten her offer, the prime minister is bringing along a delegation of 29 business leaders to promote “the breadth and depth of British expertise in technology, infrastructure, and financial and professional services,” Downing Street says. Mrs May begins her trip to Africa in her country’s largest trading partner on the continent, South Africa, where she will sit down with President Cyril Ramaphosa. She will use a speech in Cape Town on Tuesday to lay out her plans to partner with Africa using private sector trade and investment after the United Kingdom leaves the EU. 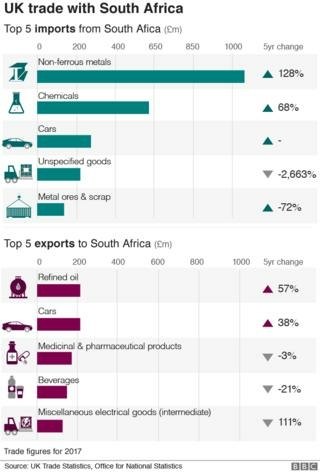 “The UK has long been an important trading partner for South Africa and certainly in the current economic climate, where many South African businesses are struggling, numerous entrepreneurs are looking to the UK to expand their reach,” Rachel Irvine, who runs a public relations and marketing agency, told the BBC. She has recently expanded her business, Irvine Partners, in London and sees significant potential in the prime minister’s visit. But she says that it is ultimately about which country offers the best deals. The prime minister’s trip comes a week before the huge Forum on China-Africa Cooperation in Beijing. 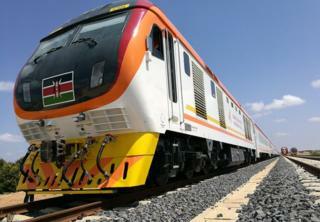 Dozens of African heads of state are expected there and China may offer new trade and finance deals. The summit comes after, Chinese President Xi Jinping’s second tour of Africa when he visited Senegal, Rwanda, Mauritius and South Africa. Mrs May’s trip seems rather low key in comparison. The British prime minister is also set to meet Nigerian President Muhammadu Buhari in Abuja, just four months after they held talks in London. Nigeria is Britain’s second largest trading partner in Africa, but should the country be so focused on the UK? Tunji Andrews, an economist based in Nigeria’s commercial hub Lagos, believes Nigeria should concentrate more on its relationship with the European Union. “The diversity of demand of the EU market makes it slightly more attractive. 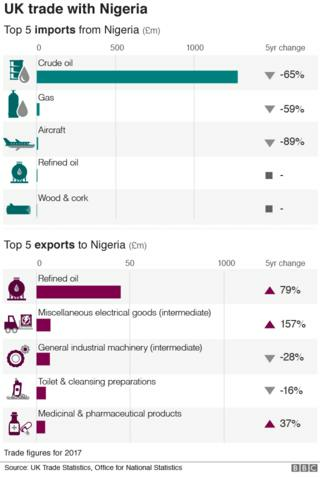 Nigeria’s top export to the UK is crude oil and its largest import is refined oil, a structural inefficiency that leads to regular fuel shortages as the populous West African nation lacks a properly functioning refinery. Mrs May concludes her maiden African trip in Kenya, becoming the first British prime minister to visit the East African country in over 30 years. The country re-exports some of its products to the EU through the UK and there are concerns that a hard Brexit might jeopardise that. But with direct flights from Nairobi to New York beginning in October, the country may be looking to tap into the larger US market for its goods. President Uhuru Kenyatta will meet Mrs May in Nairobi on Thursday just three days after discussing trade with US President Donald Trump at the White House. Overall, there is a sense that Africa is being wooed from many sides. Mrs May’s trip to the continent is part of her mission to create a “truly Global Britain”. She goes with the hope of offering a new partnership in which both the UK and Africa can benefit, but there are those who want the continent to drive a hard bargain. 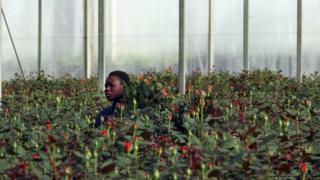 “Markets are global, why should Africa have to pick just one?” asks South African businesswoman Rachel Irvine.